Coverage: Founded in 1980, The Metcalfe Society today stands in the forefront of the world of genealogy as one of the largest and most respected one-name study groups, with over 2,000 members past and present, home and overseas. 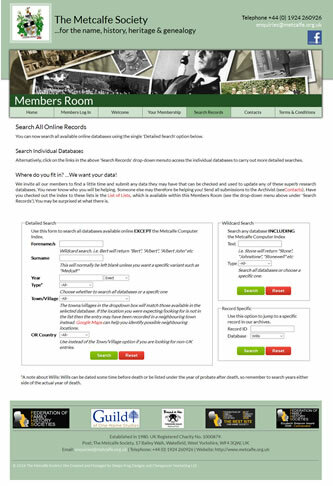 Specification: The Metcalfe Society is 3 websites in one: a main website detailing the aims and work of The Society; a members-only area offering online access to family history records and an image library which can be managed by members; an online store selling Society merchandise and processing membership renewals. The site is dynamically generated through the use of a MySQL database and all aspects can be managed by the owners through multiple admin areas depending on the level of access granted and responsibilities. "Carol at Sleepy Frog has brought together three separate websites to improve membership, provide secure research facilities to members and enable the committee of the society to manage all aspects of running the society. The content management system allows us to easily update the website and to grow as the society grows eg. additional research such as the image library and provided different levels of access for non-members, members, committee etc. The resulting professional website is fully flexible and scalable. Carol worked with the society to understand what we wanted but had no idea to how deliver it via a website. The integration across the websites now works totally seamlessly together. One of Carol's key skills is her ability to translate user wishes into technical requirements ... and vice versa back into plain English so that we could all understand. We would happily recommend Sleepy Frog to deliver a website for any small business or charity. Also as a registered charity, cost is of paramount importance. Carol's work came in on budget and she kept us advised of progress to budget through the project. We couldn't ask for any more."